Today is Thanksgiving, Michaela, and I just want to tell you that I am so thankful for you. Before you were born, I spent five years longing for you. Sometimes I look back on those years of infertility, and it feels as though God was saying to me, "Are you sure you want to do this? A high price will have to be paid, and it will hurt like hell." But I did. I wanted you more than I wanted anything in the world, and I forged ahead, pushed God aside, and with the help of my doctor and a prescription for fertility pills, finally you were here. Finally I held you in my arms. And I loved you, little girl. I loved you until my heart felt like it could burst. When you were a baby, I held you, I rocked you, I fastened you with a Snugli to me when I shopped, and when I did chores, so we were pressed together, our hearts beating as one. As you grew I watched you, and I was so proud of you. You grew into great beauty, and so smart, in the gifted and talented education program at school, and so creative, writing and drawing, and singing. But most of all you were nice, so very, very nice. However many little brothers and sisters the Lord sent into our lives, you always had your own place in my heart. My first child, you are the one who built the house in my heart and you have your own room there and always, always will. People have asked if I would chosen to have you, if I had known what was going to happen. That is a hard question. For you, for your sake ... well, I may have chosen not to have you rather than to let you suffer. But for my sake, I would never give you up. For your sake I would go through it all again and again and again. I would do it for the joy of your presence, for the sweetness of loving you. But I would choose it even considering what happened, for the vast, unexplainable richness you add to my life even in the dark labyrinth of grief, sorrow, fear and hope that has been my life for these last 26 years. You transformed me at the moment of your birth. In your loss, you continue to transform me on a daily basis, and to enrich my life beyond measure. And while really bringing up your presence in my heart is liable to set me to screaming and wailing about the horrible unfairness of it all, your presence is still warm and sweet and solid. I can still feel you in my arms. So on this Thanksgiving Day, the 27th I have spent since you were stolen away, I am thankful for you, Michaela. And I am thankful for you wherever you are, whatever you have endured, whoever you are right now, today, on this day. I love you with a love that is beyond any boundaries of time or space or circumstance or explanation. I love you forever, and forever, as long as I'm living, no matter what, you will be my baby girl. My arms ache to hold you, your grown up self. I can feel it even now, your heart to my heart, pressed together, beating out love, beating out healing for us both. Emilia, I have talked to Michaela about this in previous posts about life since she has been gone, but the general answer to your question would be not likely. Thanks for your message, though. you said you went through 5 years of infertility. that's half a decade of longing for a child, something it seems everyone else is capable of having even without trying, let alone desiring. as Michaela was the first of your children to be born, she also is the child that made you a mother. no matter how many children follow, the first is ALWAYS unique in that the first child gives you a new role in life - a role which for many women is the most important and fulfilling. you went through 5 years of wanting to become a mother but not being able to. Michaela made you the mother you'd longed to be. you may disagree with this, but i believe it's possible God allowed you to go through those 5 years BECAUSE Michaela would be abducted. (again, you can disagree, that's fine, just sharing a thought!) whether or not you believe God made it so the abduction happened, or simply that He allowed it to happen, most Christians would agree that He KNEW the kidnapping would occur - an omniscient God would know that, regardless of a person's beliefs regarding the role He played in in occurring (active or passive). 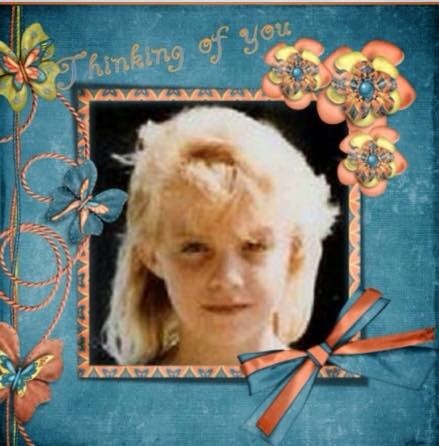 judging by the love you have for your children who came after Michaela (born both before & after the kidnapping itself) and the way you continue to reach out to your firstborn via this blog and your media efforts, i can say without a doubt that you KNEW not to EVER take her for granted! your role as "mother" was hard-earned, and after so long wanting to be a mom, you finally had your chance! that yearning & the years of waiting meant that once Michaela was finally in your arms, you knew to cherish her. every moment of every day, you knew being a mother was a gift, a prayer answered. i believe you're a better mother for the waiting to become one. so perhaps God, knowing the kidnapping would occur, allowed you to have those years of waiting. maybe it was His way of ensuring that you knew not to take her for granted, so that you'd throw yourself into the role of mom with everything you had. so that you could get as much out of the years you had together as any person possibly could. so that you wouldn't have regrets about your time spent together once she was gone. a parent who didn't have to fight to become a mom or dad - though of course they love & appreciate their child - doesn't always appreciate being able to fulfill that role because they were able to get it without even trying. you knew what a gift motherhood is, and i believe that KNOWING how precious being a mom is BECAUSE of your fight to become one shaped you into the mother you became, one who made the most of your years together. that's the best type of mother to be when your child won't be with you as long as you thought. so... just my thoughts... but perhaps God let you go through that fight so that you'd KNOW to pack as much into your years with Michaela as possible. that way you'd never have to regret taking her for granted or taking your role as her mommy for granted. here's praying & hoping you get to be that mother to her again this side of Heaven!